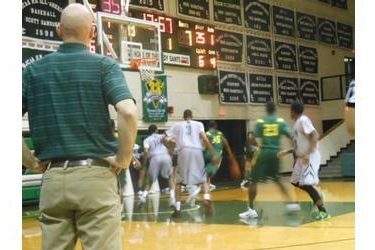 Seward dominated a team who had played in three of the past seven NJCAA championship games. Seward spanked Midland 67-48 in a game which was never close. SC led 37-23 at the half. With coaches from Wichita State, Kansas City, Idaho, and Hofstra looking at Midland’s Demetric Austin, the Saints held him to 13 points. This is the second straight year Seward beat Midland in Liberal. The SC defense held the Chaparrals to 25 percent shooting and forced 21 Chap turnovers. Kevin Smith led Seward with 20 points and six rebounds. Niem Stevenson had 17 points and seven rebounds. Malcolm Hill-Bey scored 13 points with four assists. The Saints are 3-2 and host #9 6-0 South Plains Saturday night at 8 on 1270 and kscbnews.net. The Texans topped Murray State 74-60 Friday afternoon in the Billy’s/Days Inn Classic.